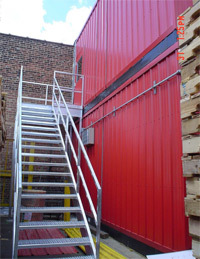 Galvanized Industrial Stairways - EGA Products, Inc.
A national distributor and installer of commercial and industrial storage equipment turned to EGA Products when they needed a Custom Stairway & Landing that would allow access to the upper level of their facility while meeting all applicable OSHA, ANSI, and local codes. 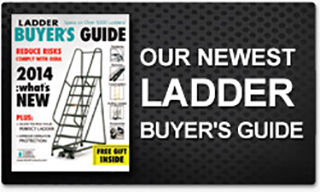 Rely on EGA to design and build custom stairways and landings like these, to the exact pitch and riser height you need. Our designers are conversant and up-to-date regarding OSHA and ANSI codes, and they make it their business to know the local building and fire codes in your location. Also look to EGA Products for other equipment that will meet the specific people-access, materials-handling, or storage needs of your industry and its processes—no matter how simple or complex your requirements.